A well researched historical fiction. 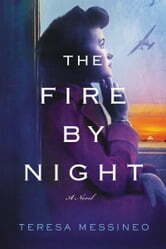 Teresa Messineo’s impressive debut novel The Fire by the Night follows two nurses serving their country on two different fronts during World War II. I have previously read quite a bit of historical fiction set in Europe, however this was the first time I’ve read about those on the Pacific front. The immense amount of research that went into writing this novel, is evident in the details. This is especially prominent in the use of medical terminology, which was included much more than is typical for this genre. I didn’t realise how little is known about the horrors female nurses faced during this time and the conditions they were forced to live in as prisoners of war. Jo and Kay’s separate stories interested me for different reasons. While I felt Jo’s perspective offered more from a psychological point of view, Kay’s kept my attention from a geographical standpoint. Unfortunately I did have some trouble with the graphic descriptions, which still haunt me even after I completed the novel. For this reason I would advise caution to those who are interested in reading The Fire by Night. I would recommend this book to those who enjoy detailed historical fiction. What an honour to read this novel. At first, given the way the woman on the cover is dressed, I thought this novel might have been about the Blitz. It was so much more. Films like Paradise Road and the television series Tenko gve us an idea of Kay's war but I had no idea about Jo's war. This really is a book worth reading. And bravo to Sister Jonathan.